There are probably as many reasons to have faith in the word of God as there are people who read the word of God. Each person who picks it up and finds strength in their faith through it does so because it speaks to them personally. In strengthening their faith, their assurance of the word itself is also strengthened. Though it is as common as candy bars at 7-11 today for people to say they trust the Christian God in general, or the Lord Jesus in particular, and yet not trust the Bible, that is a logical contradiction. One cannot say he trusts the Lord properly in one breath, and then say he does not trust the source which tells of Him in another. Not only is it illogical, but frankly, being illogical, it is then also stupid. It would be like saying, “The neighbor built a new concrete house next door to us, but I don’t believe it’s concrete.” “Did you see them build it?” “Yes.” “Did they use concrete?” “Yes.” So, why don’t you believe it’s concrete?” “I just don’t believe it is. They aren’t the kind of people to live in a concrete house.” “So you’re basing your idea about the makeup of the house on what you think, not on what it is made up of.” “Of course! Why would I ever believe that they would live in a concrete house.” Any normally thinking person would find that both illogical and stupid. And yet, the number of people who say they believe in Jesus, but then say that they don’t believe in the word which tells us about Jesus could fill the Pacific Ocean. But enough about them. For those who actually read the word, accept it as the word, and who then are strengthened in their faith concerning the word, they do so for a ton of reasons. Some, because they find it uplifting, just as God Himself is uplifting. Some because they see the harmony in the message – stretching from Genesis to Revelation. And yet, it was authored by 40 or so men, over 1600 years, in several languages, and in various countries. Despite this, it is seamless and continuous in what it states, how it states it, and the way things are stated. Some realize that Jesus is revealed pretty much everywhere, and so they come to strength of faith because of this. We could go on and on with things like this because this word is an inexhaustible source of information, wonder, and delight. If we treat it as such, it will always fill our lives with the faith it was intended to impart. For me, all of the things I just mentioned increase my faith in the word, and also in the Lord who gave us the word. But one of the things that just amazes me, and which I can always refer to in my mind when I have doubts, is the patterns found in the Bible. There are numerical patterns, there are pictorial patterns, and there are word patterns. There are also literary patterns such as poetic, chiastic, parallelistic, and acrostic. It goes on and on. Many of the patterns overlap. Many of the patterns have only been discovered in the past few years. Some of them in the… past few days. And then some that were discovered in the past have been built upon by others using new technologies. Today, guess what we will see in some of our verses? If you said to yourself, “Patterns,” give yourself an A+. We’ll start with some today, and they will continue to develop in the chapters to come. If you are like me, these will help you in your times of doubt. “Lord, are You there? I feel distanced from You.” Just think on the word, remember the patterns, and they will let you know that He is, in fact, there. If He spent so much time hiding stuff in this word that has never been seen before in order to bring the curious mind to a state of ecstasy, how much more do you think He wants you to trust the stuff that is right there in the open! Be of good cheer. He is there. He has not forsaken you nor abandoned you. This is some of the marvel to be found His superior word. And so let’s turn to that precious word once again and… May God speak to us through His word today and may His glorious name ever be praised. The words here show that the king, though probably rather incensed at the embarrassing situation, still had enough restraint to not fly off the handle. It needs to be remembered that this has been a banqueting party, and he certainly would have been enjoying the banqueting. That alone is enough to lower one’s restraint. But further, he was embarrassed in front of everyone who attended the party, regardless of the propriety of his initial request – something noted in our last sermon. And yet, he kept his demeanor as a wise king before deciding anything, and refers to his wise men. What type of “wise men” referred to here is debated. The word is a common one which simply indicates intelligent, skillful, and wise-hearted. Some scholars define the counselors of a Persian king as being in two categories. The first being astrologers and astronomers who looked to the heavens for direction. The second would be those schooled in laws and customs of the empire. The king’s counselors had an understanding of the state of the empire, how Vashti’s actions might affect it, and what the consequences of not taking action appropriate to the situation might be. In saying they “understood the times,” it is almost a metonymy where the things done in the times are spoken of as the times themselves. The same type of thought is seen in 1 Chronicles 12:32 when the men of Issachar were said to have an understanding of the times concerning David’s position as king. They knew of the importance of aligning with him to unite the kingdom of Israel into one body and then to further the army in that state. Instead of arbitrarily rendering a decision, or making one without consulting others who were skilled in law and justice, the king sought out his counselors. This was not a trait particular to Ahasuerus though. It was considered the right thing to do among each of the rulers of the empire. This is expressed in the words davar ha’melekh, or “word (of) the king.” In this sense, the “word” doesn’t signify his command, but the matter and manner of how the king approached such things. It is similar to how the office of US President works. He has cabinet secretaries, a chief of staff, etc., who are there to consult before rendering a decision. In the end, the Bible says that this is the wise path to follow. As such, it is something that we all should apply to our own decisions. Is there someone that you can turn to when you need to make an important decision? Along with prayer to the Lord, seeking out wise human advice is the right thing to do when matters could otherwise go awry. This verse closes out a set of two’s. The first was in verse 1:10, listing the seven servants of the king. Now it lists the second set of seven servants of the king. As I said in the previous sermon, two’s in the Bible signify a contrast and yet a confirmation of something. These contrast as they were seven lowly eunuchs and then seven high nobles, but they confirm the orders of the king in regards to Queen Vashti. For now, like the eunuchs in verse 10, some of the names here are very difficult to pin down as to their meaning. To attempt to find a secret code in them would be an act of finding what one is looking for, rather than finding what is actually intended. But what is interesting is that the number seven arises again. There were seven eunuchs, sent out on the seventh day of the feast, and there are now seven counselors to the king. It is apparent that, like Israel, the number seven was an important one to the Persians. The translation here is more literally stated as, “who seeing the face of the king; those sitting first in the kingdom.” To sit indicates authority in this case, and thus these seven possessed authority equal to one another, but below that of the king. These seven counselors are most likely similar to those referred to again in Ezra 7:14 at the time of king Atarxerxes. Thus, this is more than just a counsel which would be adjusted based on circumstance and choice of the king. Rather, it was a set number during the duration of the empire. As they were “seeing the face of the king,” it indicates that they had free and unrestricted access to him. Such was not the case with any others. This will be revealed as we continue through the book. For now, Ahasuerus takes advantage of the wise counsel of these men by asking for their advice. Is there law and justice in the land? How shall we approach this thing which has been done? Can we let what occurred be left to stand? If not handled, what course will we see run? The verse actually begins with, ke’dath mah la’asot, or “according to law, what shall we do.” “According to law” prefixes the question, as a strong stress. Further, there is no article in front of “law.” In other words, and as a paraphrase, “Legally, what is required?” Queen Vashti is placed as a subject of the kingdom, and thus one not immune from the standards set within the kingdom. 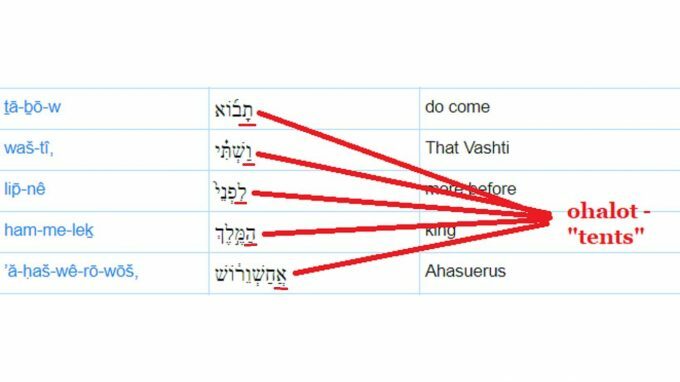 The king doesn’t say, “because she did not obey my command.” Instead, he refers to himself in the third person with, “the command of King Ahasuerus.” Here it uses a word, maamar, or command, which is found only three times in the Bible, and all are right here in Esther. It is derived from the word amar, or “said,” and thus it indicates a command, because it is the stated word of the king. Interestingly, the first time it is used is here from the mouth of the king. The second will be from Mordecai, the cousin of Esther, and the third will be a command from Esther herself. It is an implicit note of the importance of both Mordecai and of Esther. If this is so, one can imagine them actually saying this in an open and even slurred way. In other words, this all may have been conducted in front of the entire group gathered before him, and he is making light of the matter while still being precise in the handling of it. The entire episode may be one of conduct outside of a state of sobriety. If so, it might reveal the substance behind the words of verse 2:1. It is all speculation, but it might help us to explain quite a bit to look at it this way. Before giving advice on what should be done, he gives a major consideration for the king to contemplate. The first portion of that consideration is the scope of the offense. In this, he goes from the specific, the king, to the general, those below the king. He notes that it is true that the king had been wronged, but then he says that the wrong extends also to those below him as advisers. In other words, this could affect their positions, which would only cause more harm to the king. The royal court itself had been wronged, bringing the entire scope of the throne into question if the matter was to not be handled in a suitable way, appropriate to the level of the offense. But, Memucan doesn’t stop with this. As an adviser to the king, rejection of his advice would be rather embarrassing. 16 (con’t) and all the people who are in all the provinces of King Ahasuerus. Different words are translated as “husband” in the Bible. Though not uncommon, the word used by Memucan here is one of authority, baal. It means “master” or “owner.” The choice is certainly purposeful in using this word. When the conduct of Vashti towards the king is made known to the women of the realm, he argues that the obvious result will be that every woman will despise their baal. 18 This very day the noble ladies of Persia and Media will say to all the king’s officials that they have heard of the behavior of the queen. 18 (con’t) Thus there will be excessive contempt and wrath. In marvelous literary fashion, a man after my own heart, Memucan uses two thoughts when but one might be sufficient. He first says a word unique in Scripture bizayon, or contempt. He precedes it with a preposition u-ke’day bizayon, or “and thus sufficient contempt.” The idea of “sufficient” here, however, is one of excessiveness. He then adds in va’qaseph or “and indignation” for good measure. A royal decree is a published decree. It would be sent out to all provinces, and made public to all people. Coming from the king, it was considered established law. The Hebrew literally reads, “that it may not pass away.” Once recorded as a law, it would be considered fixed, firm, and unchanging. In theory, it is believed that the king could override the law, but it would be at the expense of his own honor to do such a thing. It would be considered weak and vacillating. Further, if it is written into law as recommended, the king couldn’t later blame Memucan for recommending that he dethrone Vashti. He would thus be safe from any later retribution. This is also the first of another of the author’s use of two’s in the book – the irrevocability of the law is noted here, and then it is noted again in verse 8:8. They contrast as one is concerning the authority of man over woman in the realm, and the second concerns the protection of the Jew throughout the Gentile realm. But they actually confirm what God has ordained in His word. Man is to have authority over the woman, and the Jew is to be preserved as a people forever. Such sets of two’s will continue to be used throughout the book. The law is to read that the separation of them was to be, in fact, a permanent divorce. She would never again enter into the presence of the king. 19 (con’t) and let the king give her royal position to another who is better than she. By the time we finish Esther, the words here will fit so many varied patterns that you will need a computer to sort them all out… literally. Some of the patterns came out only days before I typed the sermon as Sergio accessed the Superior Word computer over an entire night in order to run a program to find them. Great scholars, such as Keil and Lange, note the structure of the verse. 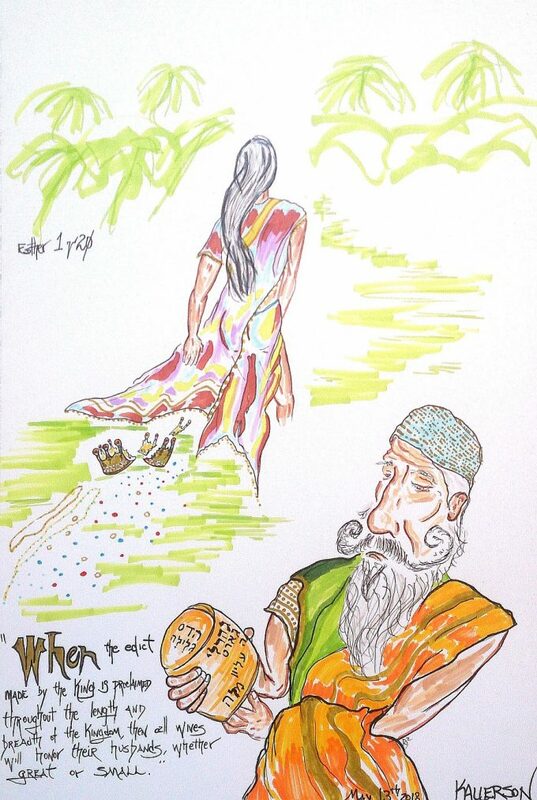 Lange says, “The predicate nishma (heard) is chosen, since it makes a presupposition for the yitenu (shall give) which is expressed.” In other words, the proclamation of the king will lead to the giving of honor by the wives to their husbands. Keil notes that the parenthetical clause, “for it is great,” is intended to flatter the king’s vanity, and induce an inclination to agree to the proposal. These are both correct, but the structure is more purposeful than just that. We’ve already noted that the name of the Lord, Yehovah, is never mentioned in Esther. But this teeny book of 10 chapters with 167 verses, is said by one scholar to mention the king 192 times. The kingdom is mentioned 26 times. The name Ahasuerus is mentioned 29 times. That is a lot in so few verses. But it would actually be untruthful to say, Yehovah isn’t mentioned at all. The first time He is seen is in this oddly-structured verse. 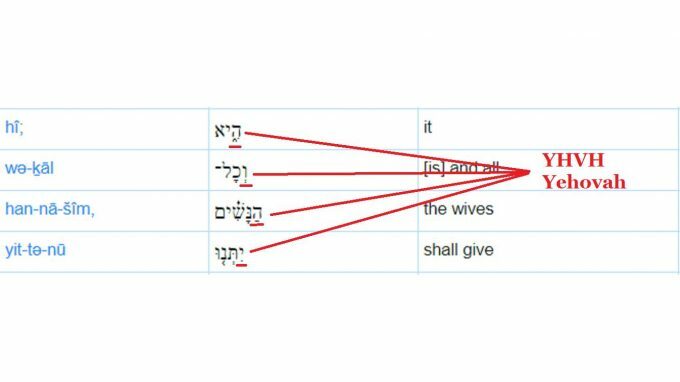 It is found in a backward running acrostic of the words hi v’kal hanashim yitenu, or “it and all the wives shall give.” YHVH, or Yehovah, is the first letter of each word, in reverse. That could be mere coincidence, but it isn’t, as you will see. This same type of symbolism is used when speaking of Babylon in Jeremiah 51:25. Here in Esther, we can see that the Lord is behind the scenes continuing to bring Israel to the point where their mountain will be brought forth; the place from which Messiah will send forth His law. All of this is being pictured here in Esther. Further, it is rather amazing because this acrostic is found in a verse about the Persian government; its mountain. The introduction of the Divine Name here brings in several instances of two’s which we already started earlier. First, this instance is spoken by Memucan, a Gentile. 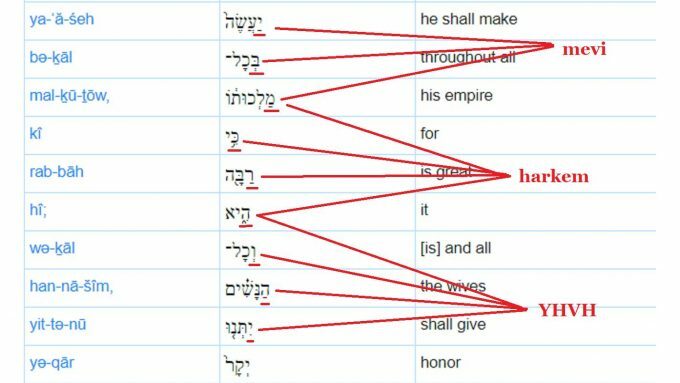 There will be four times the divine name Yehovah is seen in an acrostic. This and the third will both be spoken by Gentiles. Also, the first and the third are a pair because they both have the name spelled backwards. However, the first and the second are a pair because they have the Name formed using the initial letters of the four words of which they are comprised. Further, the first and the fourth are a pair because they are spoken about Queen Vashti and then about Haman. The third and the fourth, as we will later see, will be spoken by Queen Esther and by Haman. But this in turn makes the first and second a pair because they are both in relation to (about and by) a queen, whereas the third and the forth are both in relation to (about and by) Haman. And more, the first and the third, which both have the Divine Name spelled backward, form a pair revealing the truth that Yehovah is seen overruling what the Gentiles have counseled in order to effect His own purposes. And then even more, the first and the second, which have already been identified as a pair because they are formed from initial letters, both speak of initial facts within the story, and these initial facts are in relation to events where Yehovah initiates His will to overrule the events. All of this may be confusing, but the information is so beautifully laid out that it is not possibly by random chance. We will see this as we highlight the other sets of twos which will arise as we get to the next three instances of the hidden Divine Name, Yehovah. The words here must be taken in a general way simply because the next verse does not say that the matter was recorded in the law of the Persians and Medes. It very well may have been, and it probably was so, but the king may have simply fired Vashti and put out a proclamation concerning wives being obedient to their husbands. The king’s decree went forth copied as individual letters for each of the 127 provinces of the kingdom. It is noted by Herodotus that this was the first standardized postal system of its kind, one which is said to have been an excellent operation. Word was transmitted quickly, efficiently, and throughout the entire kingdom. It is not known how many different scripts were used throughout the empire, but it would be a large number. In order to have competent scribes, people would certainly have been brought to the royal palace from each province, and there given an intensive study in the Persian language. From there, they would be maintained as scribes for all royal edicts and other governmental notices. From this point on, at least in the kingdom of Ahasuerus, things would be a lot better for the once overwhelmed man of the house. He was now officially appointed as master. A good deal indeed. *22 (fin) and speak in the language of his own people. This was not to be accepted within the realm. The husband was to be master of the house, and the structure of the family would be based on that, including the language which he spoke. In this, there would be much less discontent for the once neglected, over-worked, and under-appreciated man of the house. We’re finished with the first chapter of Esther, and frankly as I typed this (26 February, a few weeks before you got to hear it), I was completely excited about what lay ahead. I hope you feel the same now. The story itself is just fun to read and analyze. With the added bonus of hidden acrostics and the like, it is like opening a treasure chest and seeing wondrous riches. But let’s also not miss the overall subject while analyzing the details. There is an ultimate point to what we have started in Esther. It is the protection of the Jewish people in order for God to reveal Himself in and through them. He’s done it in the word, as we have seen today, but He has also done it for His people, even in exile – just as His word said He would. In the protection of Israel, despite their state as exiles and being subjected to foreign rule for disobedience to Him, we see that God is faithful to His covenants through the patriarchs and through Moses, and He is also faithful to His promises which predate those covenants. He said He would send a Redeemer all the way back in Genesis, and He is continuing to work on that promise here in Esther. By preserving Israel, He is preserving the line through whom He would enter the stream of humanity. This is the message of Scripture. Messiah is coming; Messiah has come; Christ will come again. Be assured and reassured of this. The Lord has you exactly where He wants you. He has a good plan and design for you. At times, you might feel as if he has no great purpose for you in life, but he has brought you to this moment to reveal His glory in and through you. So follow Him and trust Him and He will do marvelous things for you and through you. She has flippantly disobeyed my demand! ———-to them also she has done this thing! ———-she refused what he demanded! Will say to all the king’s officials; just do the math!